As the Ukrainian Communists say, “shocking massacres, acts of vandalism, riots and seizures of administrative buildings in Ukraine have been shown to the world media.” The clashes have included serious injuries and even deaths to protesters and law enforcement officers, as well as kidnappings and physical violence against parties to the conflict. In reality, they say, there is a fight for power among oligarchic clans in Ukraine, and for the Presidency in particular. Calling the current events a “coup”, the CPU points to the creation of parallel institutions of power by the opposition groups, fuelling the conflict and provoking stronger responses from the authorities. Little mentioned in the West has been the role of neo‑Nazi and extreme nationalist political forces which provoke violence and confrontation. These organizations, says the CPU, include the Spilna Sprava (“Common Cause”), Trizub (“Trident”), UNAUNSO, “Right sector”, the “Freedom” party, etc. All of these organizations, warns the CPU, follow the example of Nazi collaborators like Bandera and Shukhevych, even using identical slogans. For example, a popular slogan today, “Glory to Ukraine, Glory to Heroes!”, was used during the massacre of peaceful Polish and Ukrainian residents in western Ukraine. The neo-Nazi forces have committed numerous acts of vandalism, destroying statues of Lenin and Soviet‑era monuments to the heroes of struggle against fascism. Fuelling the escalation of the conflict, says the CPU, is the political support of the Western powers in Ukraine. The U.S. State Department constantly demands that the Ukrainian authorities negotiate with the opposition, withdraw all law enforcement officers from Kiev, and allow the “opposition” to seize the government and reverse laws adopted by the Parliament of Ukraine. Contrary to descriptions in the corporate media, these laws are consistent with similar legislation in the West, such as the requirement that public organizations financed from abroad must register as foreign agents. Many western countries have implemented laws to prohibit protesters from hiding their faces, or from using helmets and shields during demonstrations. The CPU is calling for an end to the use of force, non-interference in the internal affairs of Ukraine, and negotiations to end the conflict. The attempts to create parallel structures of authority, they say, threaten to escalate the conflict into civil war and a division of Ukraine. – Declare a Ukrainian referendum on the definition of foreign economic policy of Ukraine’s integration. – Conduct a political reform to eliminate the presidency and install a parliamentary republic, and significantly expand the rights of territorial communities. – Return to a proportional voting electoral system. – Establish an independent civilian “National control” body with the broadest powers. – Conduct judicial reform and introduce the institution of electing judges. 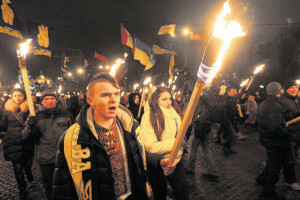 The CPU also urges international condemnation of extremist actions, fascist propaganda, and external interference in the internal affairs of Ukraine.